I got this (and the shampoo) as a gift. I LOVE it!!! BUT, when I looked at buying more, it was too spendy for my budget. I actually came across their products on accident. i was online searching for natural curly hair products and I am biracial. Anyway, I LOVE this line!! 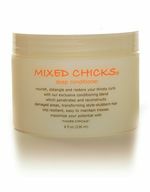 This deep conditioner is lightweight and smells nice and gives my hair ultra moisture and eliminates frizz. I am in LOVE with this product! It moisturizes hair without weighing it down. It's very light, so you could also use a tiny bit as a leave-in.